1. 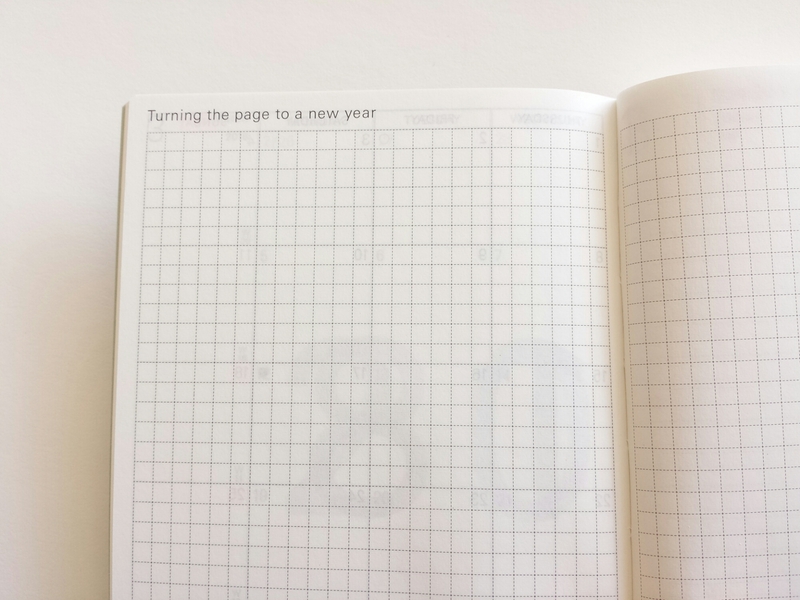 There’s a new 2-page spread at the front, just before the January pages start. 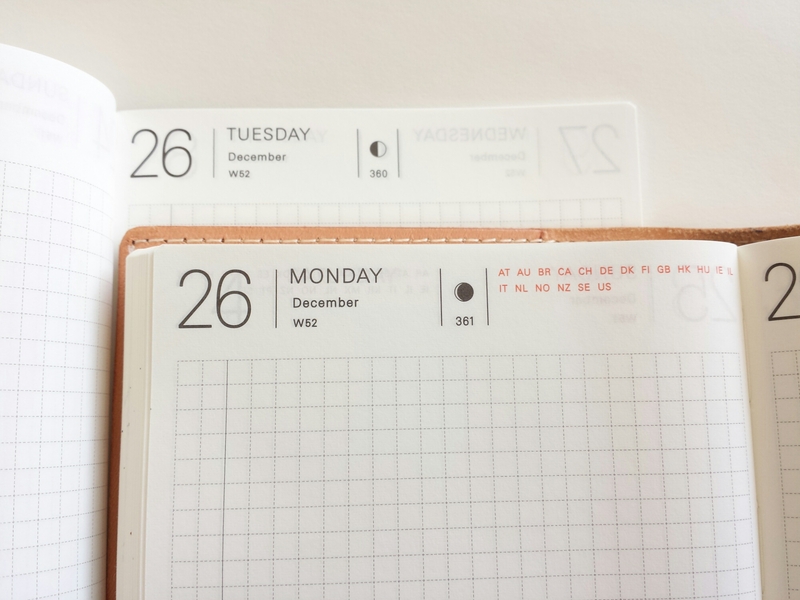 And the planner has lost the last two weeks of December leading up to the new year, as well as the first week of January 2018; it starts right on January 1st and ends on December 31st. No half pages. 2. 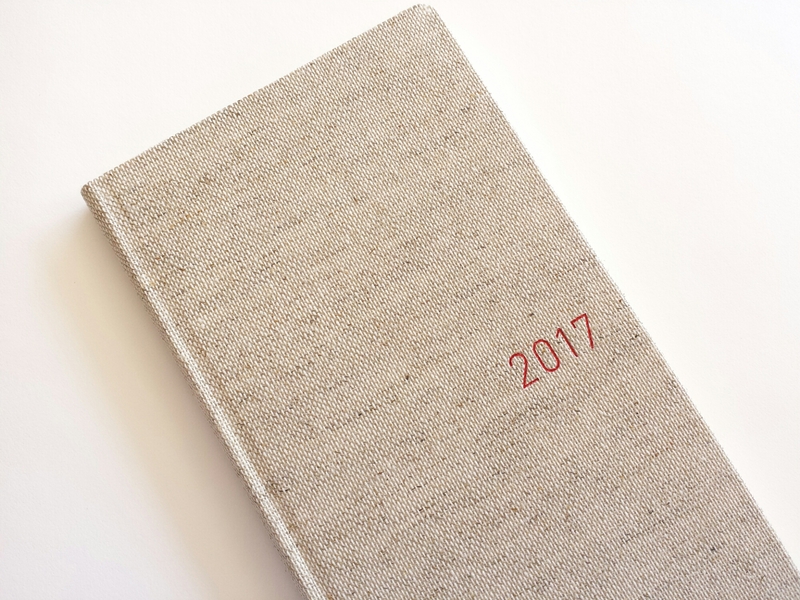 The monthly intro pages are ruled more loosely this time (the one on the left is for 2017). 3. And I see that they’ve done away with the national holiday markings in red. Good riddance – I appreciate the additional space. 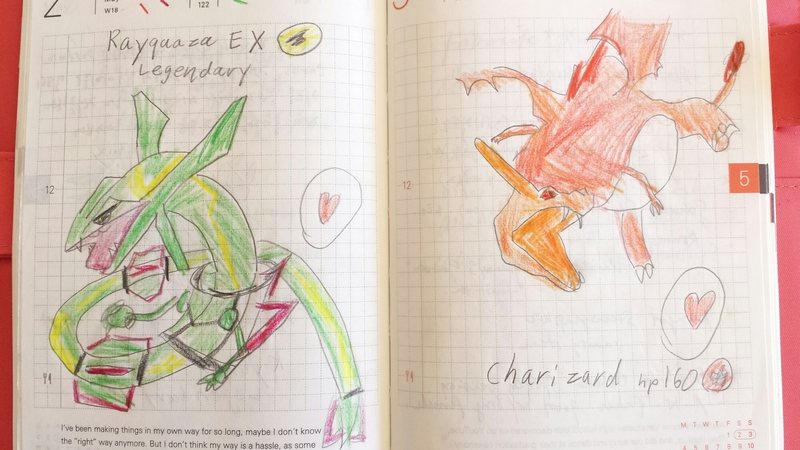 That said, I thought I would show some highlights from the past two years of Hobonichi journalling. As you may already know, I am not in the least artistic, and the biggest challenge for me is inserting visually interesting “rest stops” in between pages and pages of text without embarrassing myself. 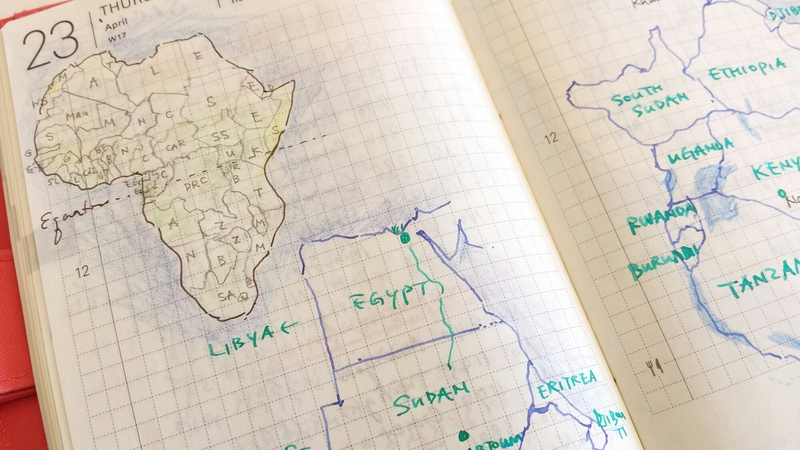 I’ve tried taping, drawing, calligraphy, etc., but my most successful attempts so far involve drawing maps. 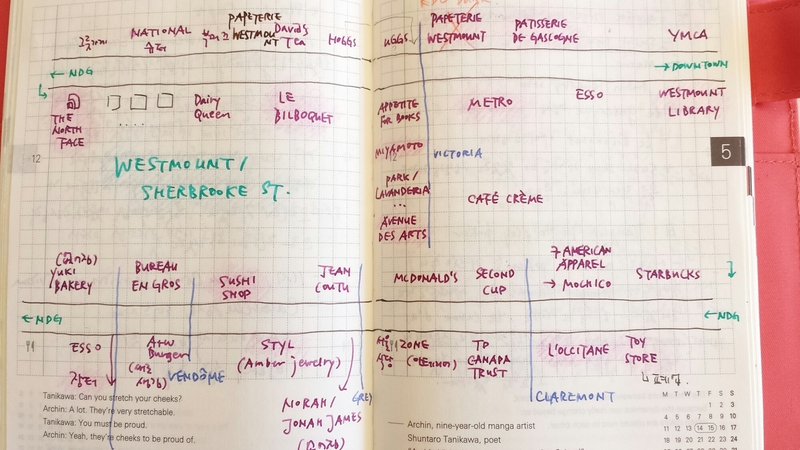 This has a number of points in its favor: you get to use all your tools, pencil, pen and colored pencil; you actually learn something during the process; and it stays relevant and informative even years afterwards. This was my first attempt at map-drawing; it was just too small and I had to draw additional area enlargements. By the way has anyone read Dark Star Safari by Paul Theroux or Don’t Let’s Go to the Dogs Tonight by Alexandra Fuller? The former comes recommended by Haruki Murakami (he’s friends with Theroux), and the latter is just as good. And then we moved to South America. 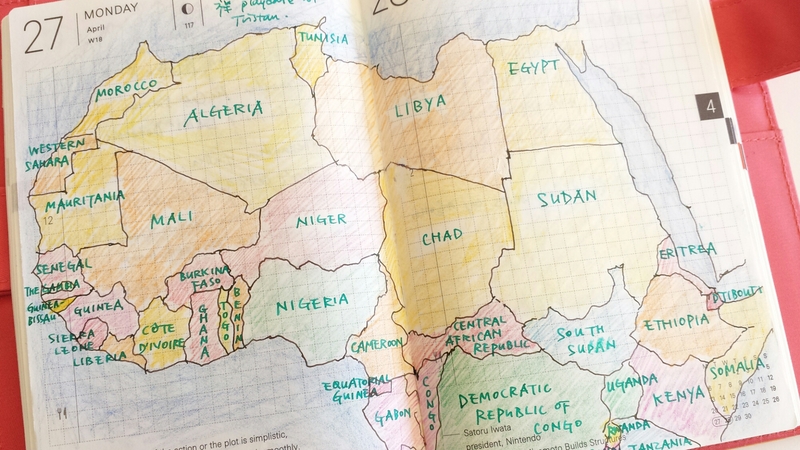 In order to sort out the muddled heap of countries in my head, I again resorted to maps. 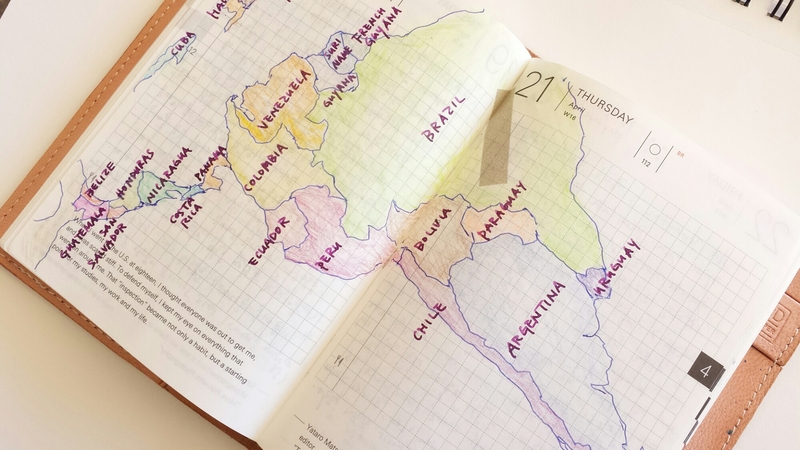 Brazil is reeeally big; I couldn’t get it to fit on the page . One disadvantage of the onionskin Tomoe River paper is that you have to be very careful with erasing, and even then you get small tears from time to time (witness the grey masking tape over the Amazon). 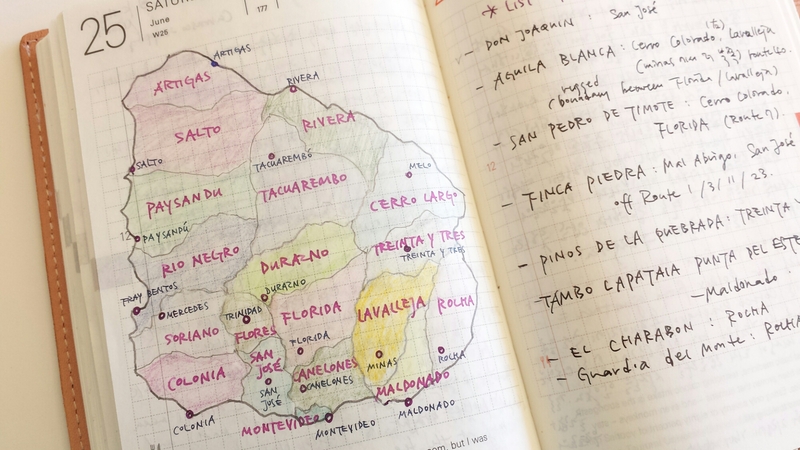 This map of Uruguay is the only time I used tracing paper, because a map of just the right size happened to be printed on the back flap of a school notebook. Departmental boundaries were done by visual approximation, as with all the other maps, and thus are inexact. You don’t always have to draw countries; if you’re in love with your neighborhood you can map out its streets too, especially if you know you’re going to leave someday and will miss it, like I do. Also there’s nothing like map-drawing to put your factual knowledge to the test: I found out that I had the order of some shops wrong when I checked some days later. 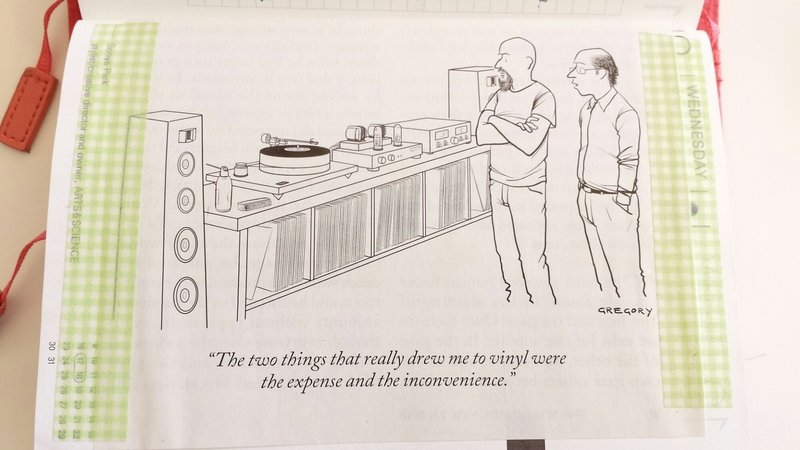 And cartoons go very well of course with the overall Hobo vibe. I only regret that I had to convert all my subscriptions to digital editions and therefore have almost no material to snip out stuff from now. I also found a way to use up the box of Midori roll stickers I was hoarding. I use it like a ticket stub for any Netflix movie I watched. And if there are still any blank pages left over even after all that, you can always engage a guest artist! 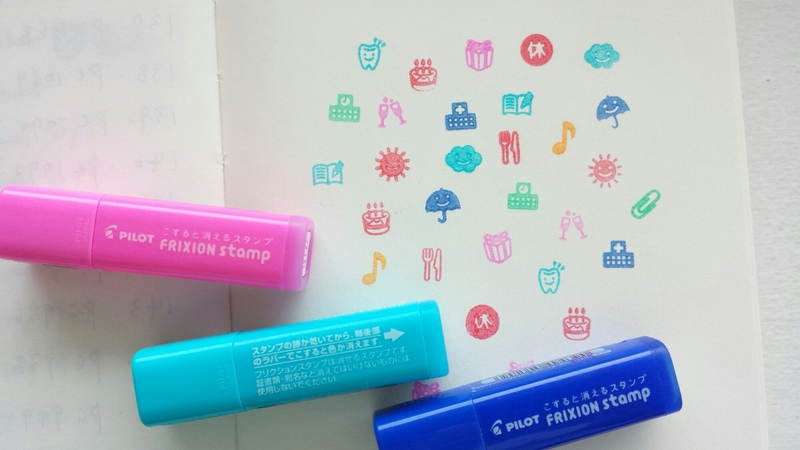 These cute stamps represent the latest application of the erasable Frixion ink. I wonder how many people would buy these for the properties of the ink itself? 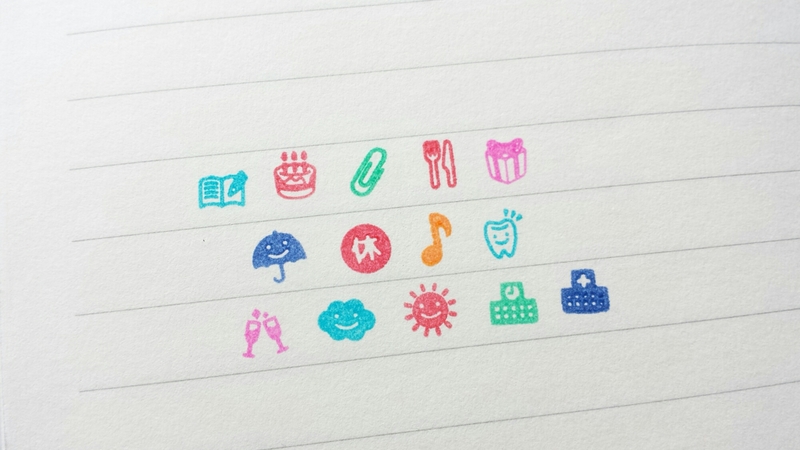 To me, they are just cute, portable stamps. Of course, schedules change and appointments shift, so it would be useful to be able to erase anything. 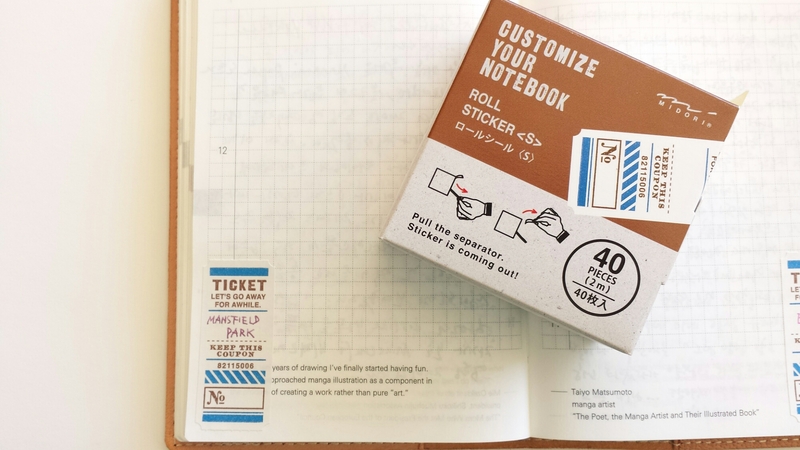 They’re not the usual schoolgirl stuff but for adult journaling, since the range of 60 (30 at the time of my purchase, but very recently expanded!) include signs for “payday”, “drinking party”, “golf” and “business trip” (not included in the picture above, since I bought other kinds). There are also Chinese-character signs for holidays (or days you took off from work) and days you reported for work despite it being the weekend. However, they still lack some important signs – most notably, “overtime (i.e. working late and taking the last train home) and “shopping”, both crucial components of life in Japan ;) A separate sign for “cinema” would have been nice too, but instead they have included “The Scream” by Munch. Very few shops outside of Japan carry these stamps (I’m not sure whether they sell it in Korea even), and the shops that do offer a very limited selection at steep prices. This is probably because a lot of the signs are Japanese-specific and so demand is limited. 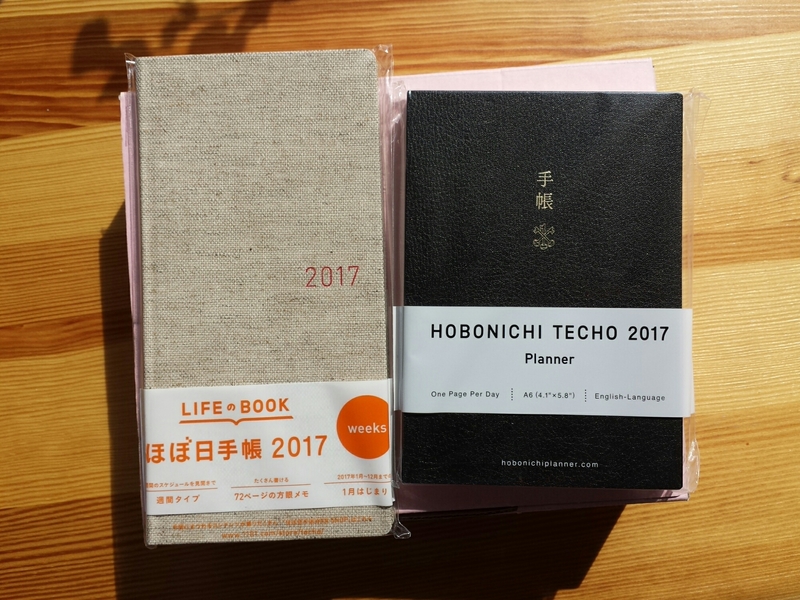 I had the chance to order some with my new Hobonichi planner at the Hobonichi official shop, and the rest I had to source on eBay. 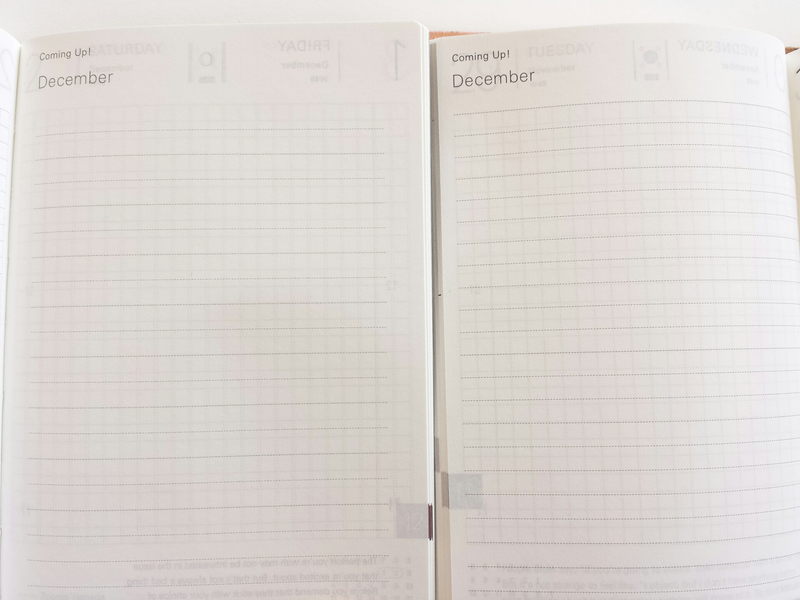 While they seem like the perfect companion to a planner like the Hobonichi, in reality the properties of the ink and paper do not go together that well. The Frixion ink is a bit sticky, and on less absorbent paper like the Tomoe River it tends to pool in dots. I’ve found that however long you wait for the ink to dry, you always have to blot it, otherwise it transfers on to the opposite page. Of course, the great advantage of Frixion is that it can be erased, and the stamps come with a rubberized rim for that purpose. But I advise you not to use that eraser if at all possible. It distresses the paper and leaves marks, especially if the paper is as thin as the Tomoe River. 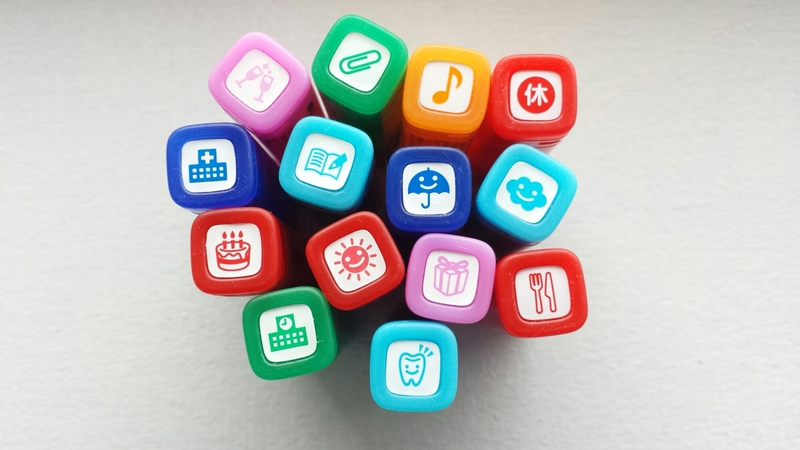 If you must erase something, use the round eraser on any Frixion pen, it’s gentler and more efficient that way. 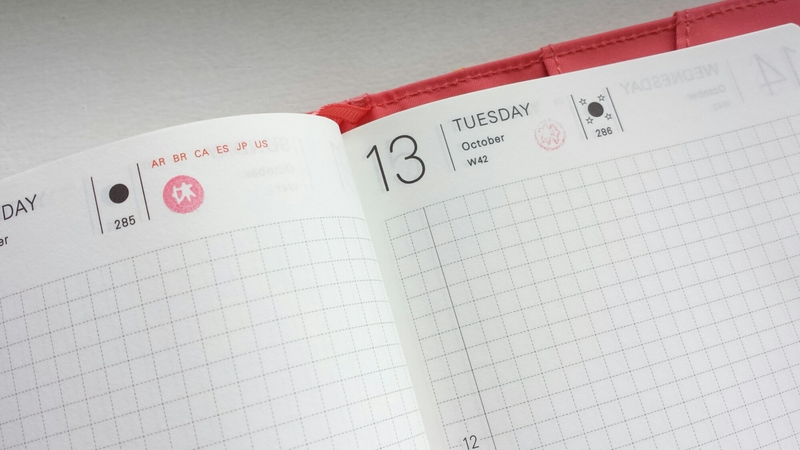 The Frixion stamps use this quintessentially Japanese ink reservoir system, in which the ink is stored in the stamp itself. This self-inking system (as far as I know) was pioneered by the Japanese firm Shachihata, which I will write about in a separate post. In theory it should be possible to refill the ink once you use it up, but judging by the price I think these stamps are meant to be disposable.